Since you have started reading this blog, we can rightly assume that you are interested in knowing about the latest typography trends. 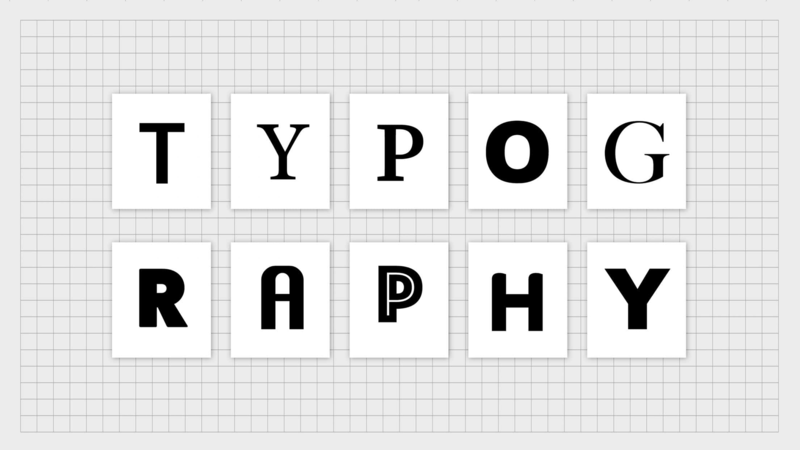 typography, i.e., to establish a unique persona of your brand. So, now you know the importance of the role it plays, you must also understand how dynamic it is, at the same time. While some trends have become eternal, but on the other hand, some are in a continuous state of evolution. So, the question is – are you keeping up with its dynamic nature? If Yes, continue to read the blog to check if you have all of them in your basket! If No, Well! Do I need to say more? Geometry isn’t just limited to your Mathematics books. Geometric fonts are one of the hottest trends in the design world. It consists of clean, straight lines and perfectly round circles. They provide a perfect blend of futuristic and modern appeal. They inherently bring a certain degree of sophistication. Hence, they are often used in the representation of a theme that’s related to science, technology or engineering. Looking at the trends, 2018 will witness their use in multiple genres, like the ones stated above and in various genres of branding, due to its bold and catchy appeal. Handwritten styles are all set to hog the spotlight with the unique identity bestowed upon the user. In addition, they can be customized, thereby, making the end product totally different from the mundane fonts we are more habitual to see. While hand-lettered fonts have been bold and clean in past years, we’re seeing an uptick in more casual, brush stroke fonts with a little more edge and feel. The rawness of the fonts has being appreciated globally. Personally, we at The Hustler Collective feel that with the handwritten fonts, you don’t need to be as precise and clean, compared to the classic sans and sans serif typefaces. For creating a font from your own handwriting, you will need to take care of all the connecting strokes and provide a seamless handwritten text flow. This trend might not have enjoyed much popularity in the beginning of this year. However, it is catching up and grabbing eyeballs now. So, what is it exactly? Cutouts and overlays fundamentally refer to text elements that don’t have color fill. Cutout allows showcasing of the matter in the background layer to be shown through the type design. An overlay is often transparent lettering over a background, so that you can see the background through letters while still reading them. Ways are devised to make these techniques fun, bright and bold. Interesting elements like parallax backgrounds, animated effects, and stunning photography are used for overlaying or on cutout texts. We personally recommend you to not overdo the design effects, as it might look a little too much! Embrace the fun that it brings by itself. The recent popularity of watercolor designs has moved hand in hand with handwritten fonts, since they compliment each other so perfectly. But in 2018, we saw a deviation, when the actual type appeared in a watercolor style, as well. A watercolor typeface looks like it is created with a paintbrush using watercolors. While decidedly not an “edgy” choice, these fonts are feminine, dainty, and refined. Some consider it as a perfect complimentary partner to handwritten fonts, while some consider it as their escalation. Either way, we love it completely. From its appearance, it looks like a typeface created by multiple strokes of watercolors. One of the reasons behind its popularity is the handcrafted appeal it gives i.e. giving every work a unique life of its own. In general, this style is considered feminine, dainty, and refined in its appeal. We personally would like to break a general belief about watercolor fonts. While many of the most popular watercolor styles are created with a brush script, it’s not a necessity. All you really need to make it work is a typeface with thick strokes so that the color stands out. Vintage creates a nostalgia to captivate us automatically. Wanna say no? Well, we all said yes to choker necklace, a pair of Adidas Originals, or Pokémon Go. The amount of acceptability these products have gained is an example of the kind of impact vintage products have on us. In the era of the graphic designing world, we are still stuck with Vintage fonts, happily. Everywhere you look, designers are using the old style, grungy yet elaborate, type options. In fact, they are being amalgamated with some modern fonts to create something absolutely new. This chunky display font marries Swiss Style minimalism with disco styling as a result that feels clean and elegant. Retro vector font by fontStocker. They might feel rough and hand-drawn. They can evoke the ornate style of vintage signage. Yet, these typefaces have a classic appeal. Serif Typefaces are known for their clarity, readability, and elegance and they are making a comeback in 2018. Serif fonts fundamentally are the ones that have lines at the end of each character. They are most appropriate for traditional or serious purposes. In contrast, the sans-serif font type is without additional lines. Thus, they are a preferable font for modern designs. The recent rise in opting for Serif fonts comes from the preference for minimalism. It’s neat and tidy appeal gels well with a minimalistic approach to designing. In addition, depending on the design and nature of your blog, you can use serif font and combine it with other font styles to make it more creative. We personally feel that serif is one genre of fonts where you can experiment a lot. It is simple in its formations and gives room for creativity. Display fonts are not just typography, every letter is an art piece in its own way. They set the mood or feeling of the brand in the most conspicuous way. The loopy, creamy letters on the “Melt like an ice cream” design shows the beauty of this font. They easily grab attention and stand out. Now obviously they aren’t the perfect choice for long paragraphs. But it’s a perfect choice for banners, large screen setting or as headings. All in all, they bring personality to your brand. Want more? Connect with us and get access to the marketing secrets you have never heard more!